The Obama Administration proposed a $3.73 trillion budget today. The administration also said they expect the Obama deficit to grow to a record $1.65 trillion this year. Barack Obama tripled the national deficit in one year. Last year it was at $1.29 Trillion dollars. This year it will be even higher. And next year the deficit is also expected to be over $1 trillion dollars for the fourth straight year in a row. President Obama is sending a $3.73 trillion budget to Congress today. President Barack Obama is sending Congress a $3.73 trillion spending blueprint that pledges $1.1 trillion in deficit savings over the next decade through spending cuts and tax increases. Obama’s new budget projects that the deficit for the current year will surge to an all-time high of $1.65 trillion. That reflects a sizable tax-cut agreement reached with Republicans in December. For 2012, the administration sees the imbalance declining to $1.1 trillion, giving the country a record four straight years of $1 trillion-plus deficits. Senior administration officials say Obama would achieve two-thirds of his projected savings through spending cuts that include a five-year freeze on many domestic programs. The other one-third of the savings would come from tax increases, including limits on tax deductions for high-income taxpayers. 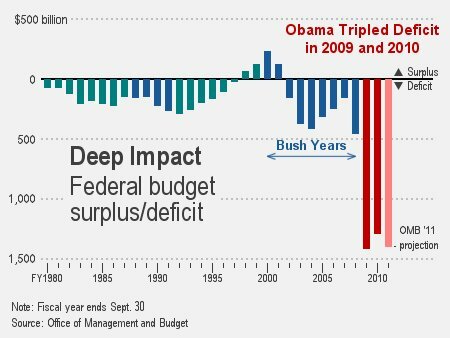 Even before Obama’s new budget for 2012 was unveiled on Monday, Republicans were complaining that it did not go far enough. They branded Obama’s budget solutions as far too timid for a country facing an unprecedented flood of red ink that has pushed annual deficits to all-time highs above $1 trillion. “We’re broke,” House Speaker John Boehner said Sunday on NBC’s “Meet the Press.” He was defending a Republican effort not only to squeeze more savings out of Obama’s 2012 budget but also to seek $61 billion in cuts for the current budget year. The Obama Administration say they intend to get two-thirds of the $1.1 trillion in savings from spending cuts and one-third from tax revenues. That comes to $367 billion in tax hikes.